Question:I need to find or develop an app that will load in a PDF file from the web, allow a user to make simple annotations and save these annotations back to a web server.I'm currently using some annotator with the PDF rendered to a .jpg. Just now, I was told that they need the ability to zoom in to 3000% or more on some files. clearly rendering to a jpg would create gigantic files. So I need to create either app that will load the original PDF which allows the user to mark it up and save either the annotated PDF , or the annotations themselves back to the webapp. This also needs to live IN the web browser, launching acrobat reader, or an air app that must be downloaded and installed are not going to work here. So I am wondering is there any alternative strategies on VeryPDF? Answer: Your question sounds quite complicated but exactly your requirement is quite simply. 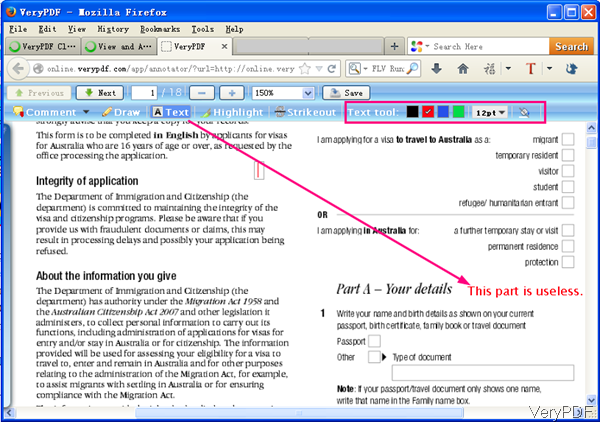 All you need is just to load a PDF to website allowing users to annotate PDF. After annotation, you need to check the annotated PDF or the annotation information. If I understand you in a wrong way, this question already has an answer on VeryPDF cloud based application, it is VeryPDF Annotator Cloud API (Online PDF Annotation Cloud API), by which you can add notes to PDF, Word or image files right from your web browser and share documents. Please get more information of this software on website, now let us check how it works. The following snapshot is from the website of PDF Annotator Cloud API, please have a check. Three steps can help you load PDF to website. Checking from the website, this software also can help you annotate other file format files like DOC, DOCX, XLS, XLSX, PPT, PPTX, HTM, HTML, TXT, RTF, GIF, JPEG, JPG, PNG, TIF, TIFF, Multipage TIFF documents. PDF is just one of them. 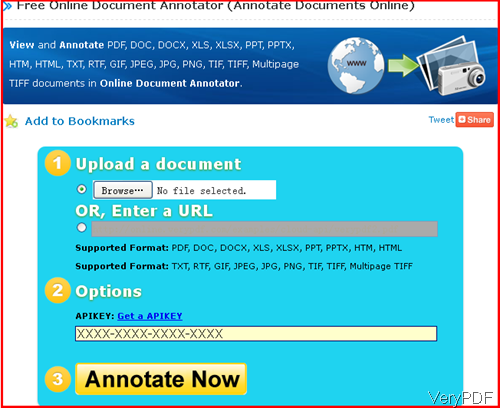 Upload PDF to website by clicking button Browse then click button Annotate Now. After clicking that button then you will enter another annotation page where you can annotate PDF like adding comments, text, drawing lines and others. The following snapshot is from annotation website page, please have a check. In the above example, I take adding text to PDF for example. Click button Text then you can choose text color, text size and position. Meanwhile you can add comment to PDF by clicking button Comment. When you finish annotation, there will be PDF link produced if you click button Save. Actually this feature can satisfy your needs of checking annotated PDF. All you need to do is that just keep record of all the produced URL then you can check them one by one. This software can solve your problem of loading PDF and annotate PDF. During the using, if you have any question, please contact us as soon as possible.